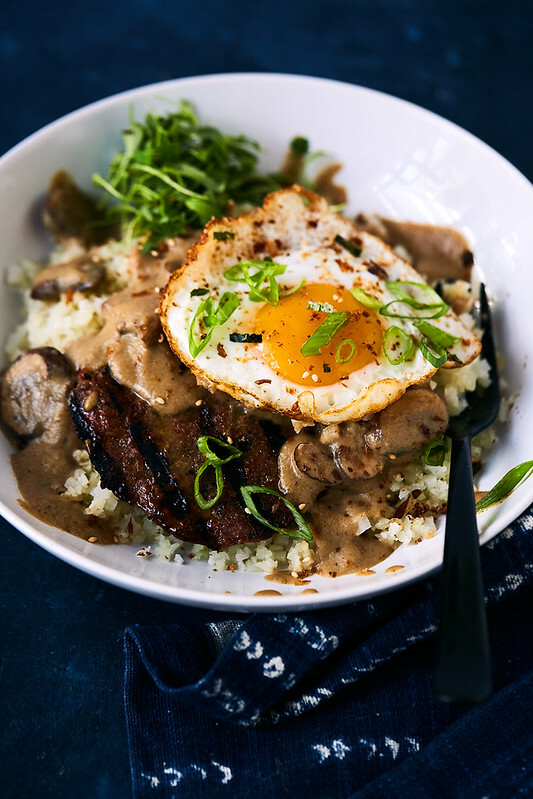 This Keto Loco Moco Breakfast Bowl is a lightly updated version of a classic Hawaiian comfort food. 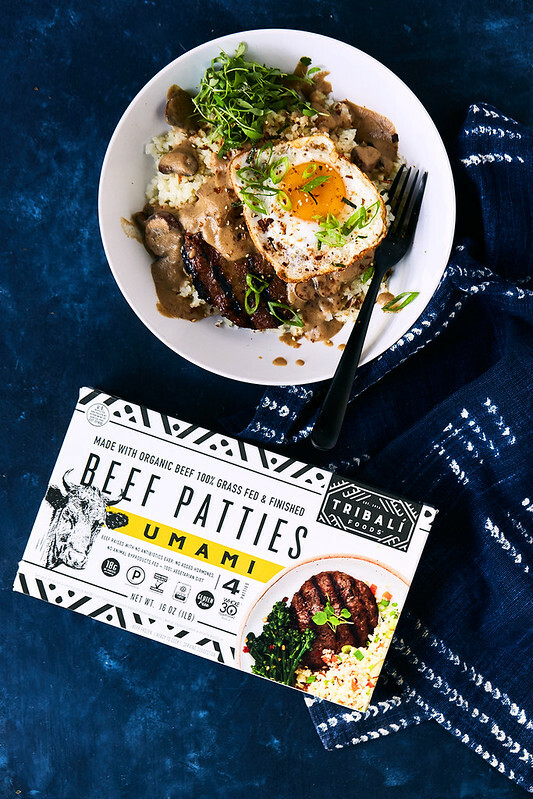 We swap the traditional white rice with cauliflower rice and with flavorful Umami grass-fed beef patty from TRIBALÍ Foods and epic mushroom gravy make this a savory dream come true. 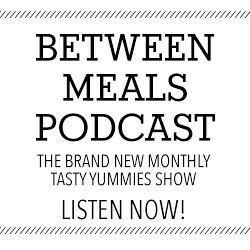 If you haven’t been able to tell by recent recipes here on Tasty Yummies over the last 8 or so months, I was incredibly touched by my two trips to Hawaii in the last year. The food clearly made a major impression on me, among many other things. 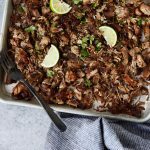 Beyond the flavors, of course, I love the varying cultures that inspire the cuisine, as well as the locally accessible foods that influence the food. One dish that continuously peaked my interest (AKA haunted me) on both of my visits to the islands was the Loco Moco bowl. Loco Moco is classic Hawaiian comfort food. Traditionally made with white rice, a burger patty, an over-easy or fried egg, and a generous serving of beef gravy, often with mushrooms, it’s basically a Beth dish, if there ever were one. Savory, unfussy, non-pretentious, comfort food with an undertone of umami. GAH! Dream status. The bad thing, I could never ever ever enjoy one while I was on the Islands, the gravy ALWAYS contained gluten, every single restaurant, I would ask. So, I creepily creeped on anyone that ordered it near me, took mental notes, maybe drooled a little and couldn’t wait until I could recreate one at home in a way that I could enjoy. 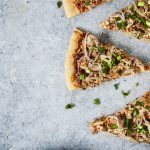 As usual, besides the given of recreating a recipe without gluten, I wanted to created something that was totally grain-free and as always, prioritized quality ingredients, most importantly the beef! You all know how important the quality of my animal proteins are to me. 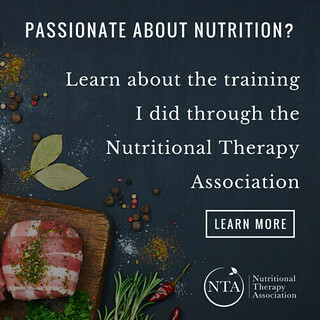 You can read more here about the differences between grass-fed and grain-fed beef and why I choose to make this a focus of my nutrition. I know prioritizing quality of food can often feel overwhelming, but we cannot afford not to make as many attempts as we can for better quality, our health depends on it. I am also intensely passionate about supporting the companies prioritizing not only better quality but also transparency in their supply chain. 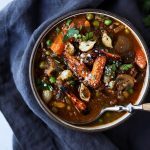 TRIBALÍ Foods was created by Holistic Nutritionist, mom and former vegetarian, Angela Bicos Mavridis, who merged her passion for wholesome, nutrient-dense foods with globally-inspired flavors for a delicious, healthy meal option. After meeting with Angela in person and bonding instantly over our Greek heritage, our connection ran even deeper as we shared our health and healing paths and our commitment to high-quality, sustainable foods that actually taste good!! I fell in love instantly with TRIBALÍ and Angela. TRIBALÍ Foods‘ patties feature 100% organic grass fed and finished, pasture-raised beef and 100% organic free-range, air chilled chicken, all meat is humanely raised on family farms without any added antibiotics or added hormones, and blended with locally sourced herbs and vegetables like shiitake mushrooms, poblanos and fire-roasted garlic. 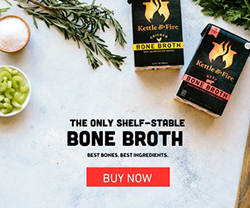 You can buy TRIBALÍ Foods online (use coupon code YUMMY to save 20%), or find them in the freezer section of select Super Targets from coast-to-coast, in Southern California at natural retailers like Bristol Farms, Lassen’s, Lazy Acres, Erewhon and Gelson’s and now all of the Natural Grocers locations across America. 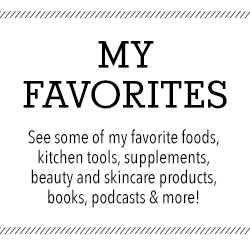 I get mine locally at our Whole Foods and you can check out the store locator to find a retailer near you. The Umami Grass-fed Beef Patties were the perfect choice for these bowls, having fire-roasted garlic, onions, and woodsy Shiitake mushrooms — with a tangy hint of nori seaweed, a dash of Red Boat fish sauce, and umami spices. 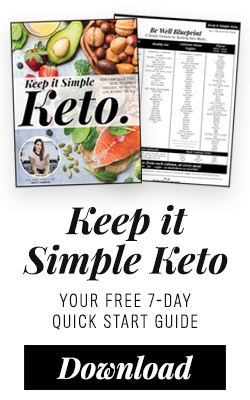 I love that they are paleo, keto and Whole30 friendly, but they are also AIP compliant. WOAH! 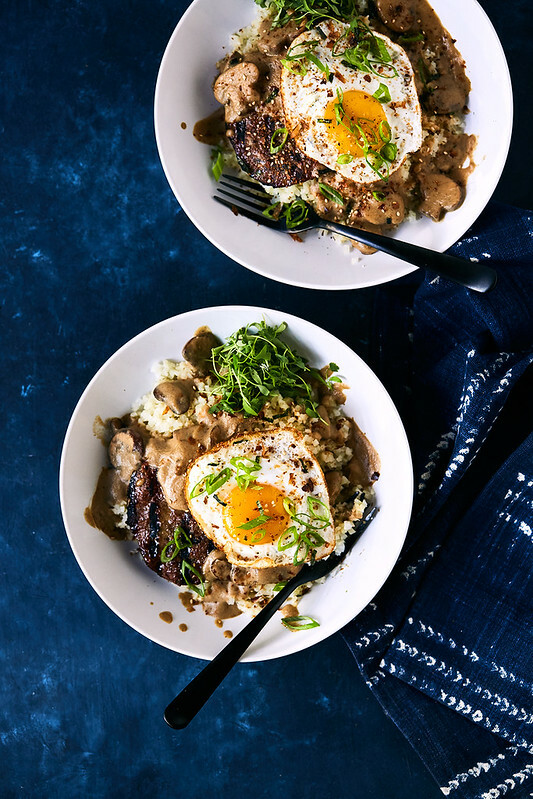 With the umami rich beef gravy the punch of flavor if this comforting Keto Loco Moco Breakfast Bowl is unreal. I cannot wait for you to experience this, too! Breakfast just got a whole lot better and better for you, too! Make your Beef Mushroom Gravy (see below). While the gravy is reducing, cook your cauliflower rice, fry your eggs. 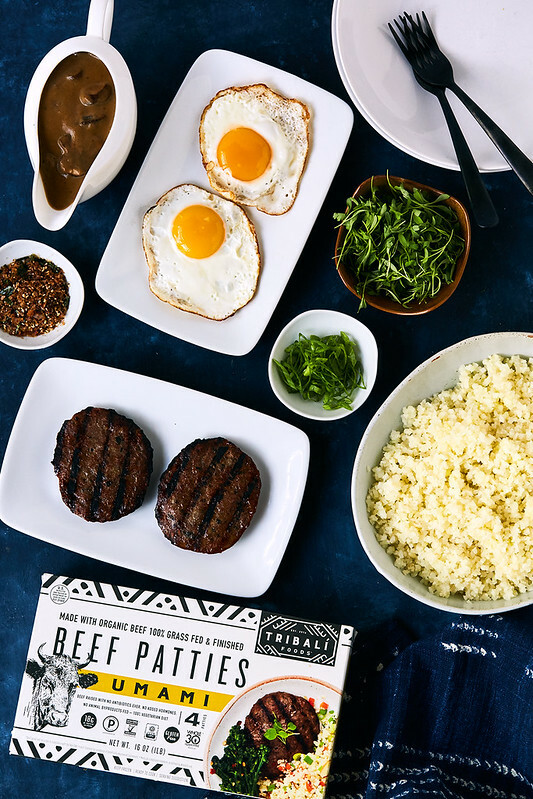 And grill, broil or cook your TRIBALÍ Umami Beef Patties according to package directions, until done. 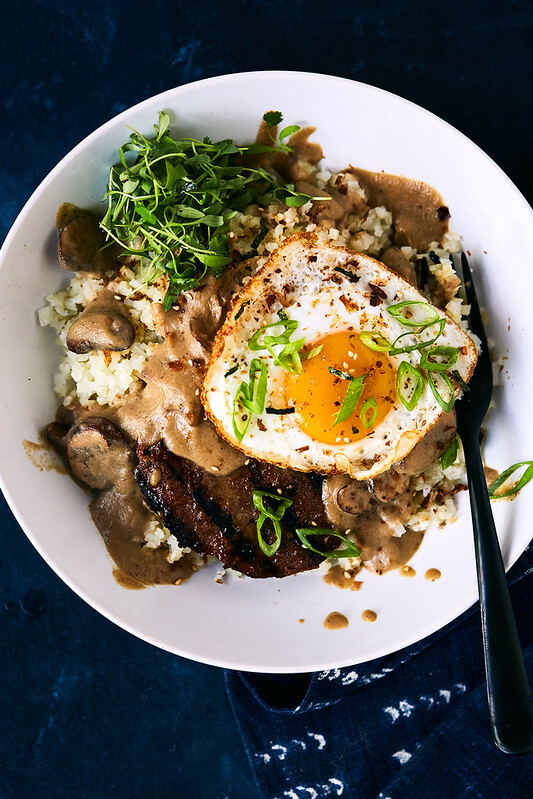 To assemble your Loco Moco Breakfast Bowls, each bowl gets a bed of cauliflower rice. Top each with a hamburger patty, half the mushroom gravy (or as much as you’d like), top with the fried egg, thinly sliced scallions, cilantro or cilantro micro greens. Give a generous sprinkle of furikake seasoning, if you are using. Serve and enjoy! 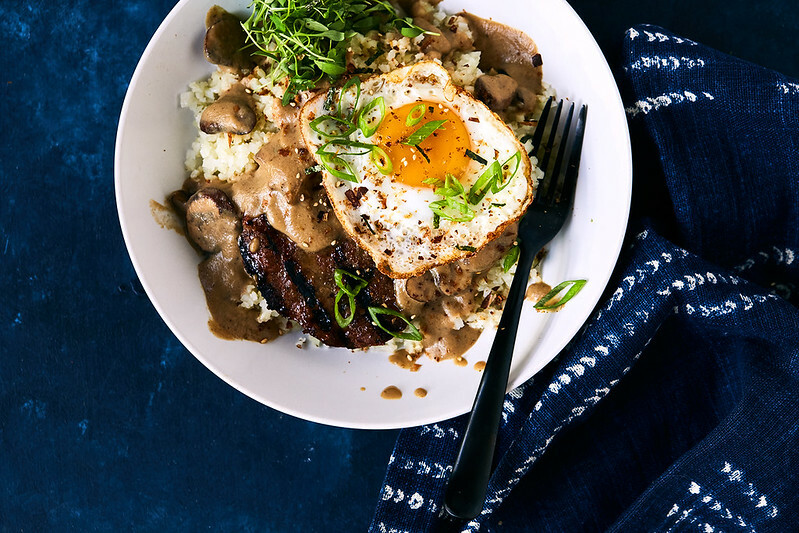 To make Autoimmune Protocol Friendly Loco Moco: Leave off the egg and furikake. Be sure your beef broth is AIP compliant. Most store-bought furikake seasoning contains sugar and MSG, often it contains gluten and soy. I either make my own or when I can find it, I buy this or this when I can find it. A quick google search for "Paleo Furikake" will get you a few recipes. Add 1 tablespoon of ghee butter or oil to a medium sauce pan over medium heat. Add the mushrooms and cook until caramelized, 3 to 5 minutes. Remove the mushrooms and any cooking liquid from the pan in a bowl, set aside. Add another 1 tablespoon of fat, add the diced onions. Saute for 10 -12 minutes, until soft and translucent. Add the garlic cloves, and coconut aminos, cook 2-3 minutes. Add the broth, half of the mushrooms, increase the heat to a medium-high, cook on a light boil / aggressive simmer and let it reduce, by almost half, should take approximately 20 - 30 minutes. Add salt and pepper, to taste. Blend the gravy until smooth and creamy, either in a high speed blender or using a hand held immersion blender. Stir in the remaining mushrooms. 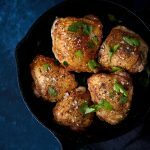 This post and recipe were created in partnership with TRIBALÍ Foods’. 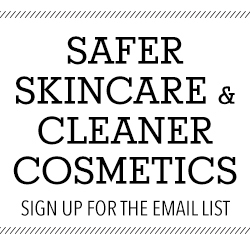 I am proud to work with brands that care about the health of its consumers and the planet. As always, all opinions, ideas and text are my own. Thanks for supporting the sponsors that allow me to create new and special content like this for Tasty Yummies.